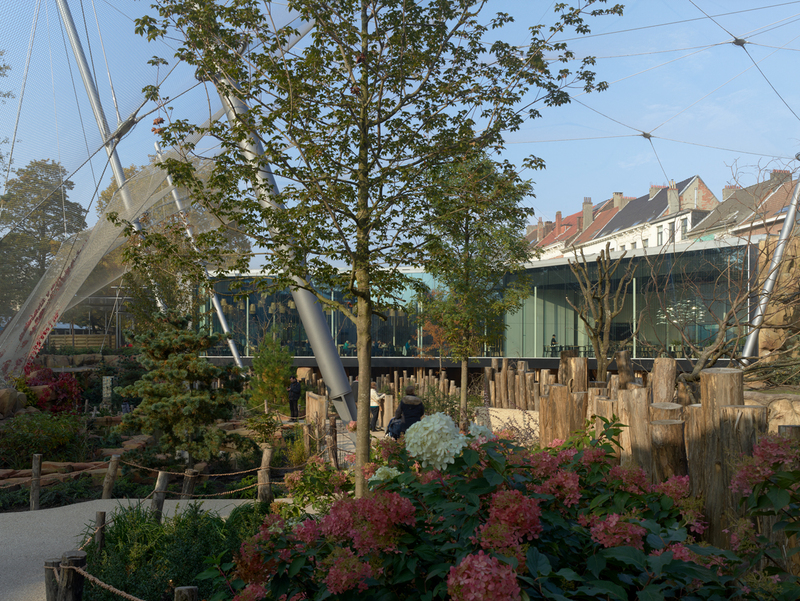 The Antwerp Zoo, one of the worlds oldest zoological gardens, is located in the city centre, next to the central railway station. The park as a whole, including all of it’s buildings is listed heritage. 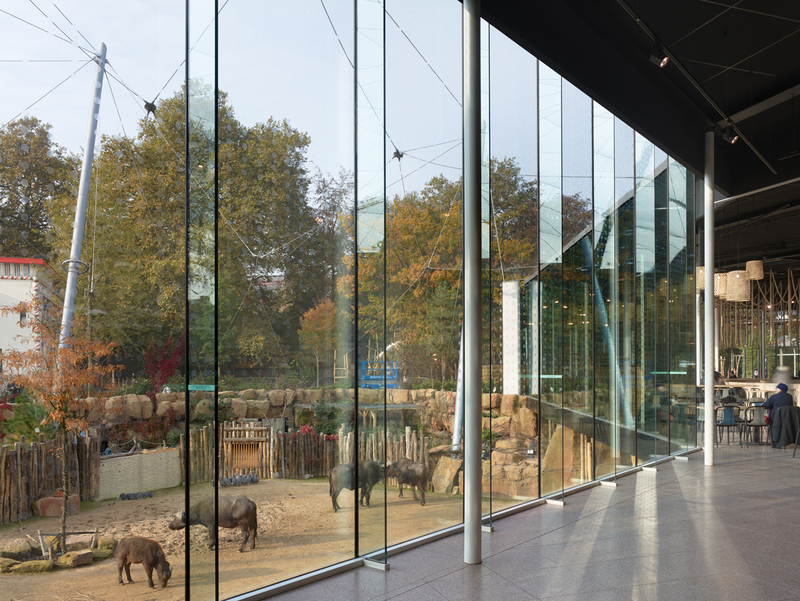 In this context, eld was appointed to develop a masterplan for the south-eastern part of the zoo, including the latest extension of the park. 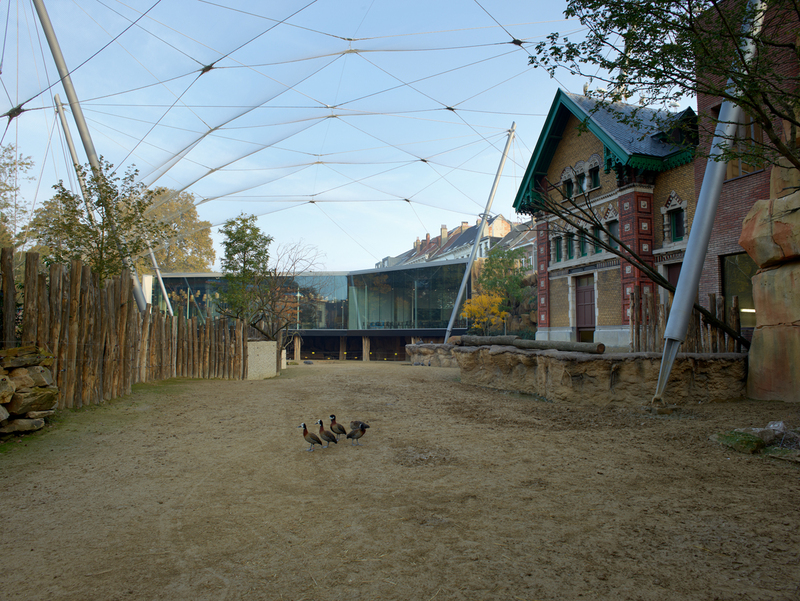 This masterplan includes accommodation for giraffes, buffalo, flamingoes, apes as well as one of Europe’s largest aviaries. 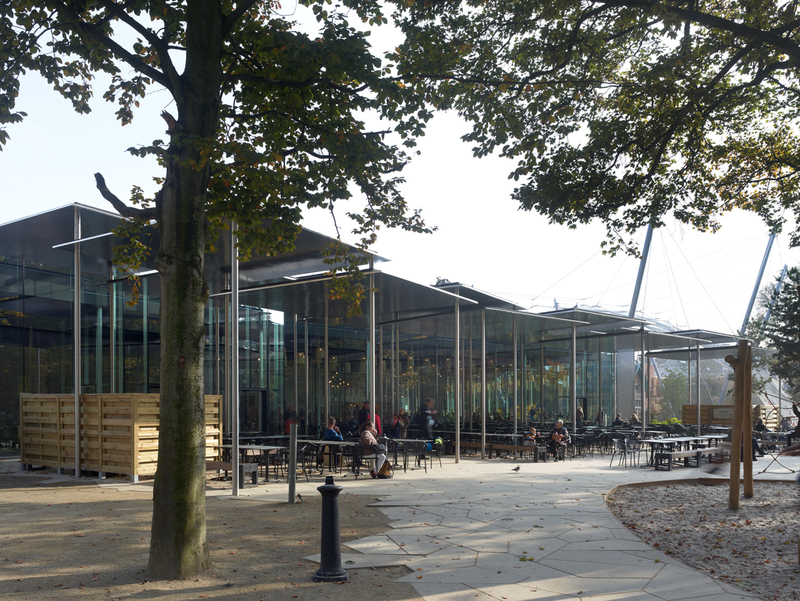 In the middle of this, Studio Farris Architects designed a new visitor restaurant with a view over the new artificial savannah. 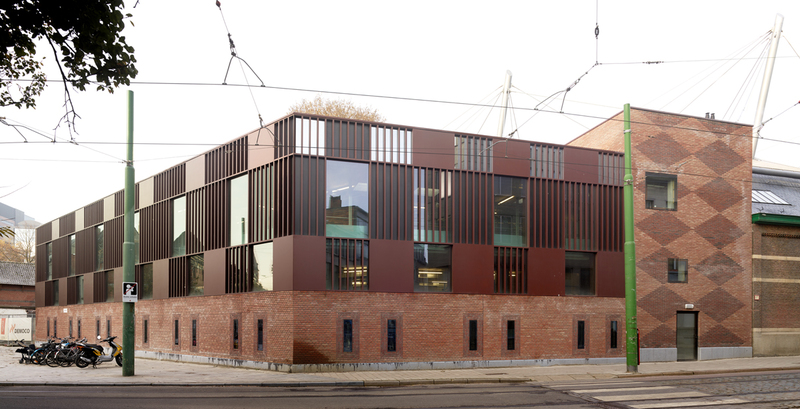 Origin architecture & engineering provided the expertise for restauration of the listed buildings, and Fondu Landscape Architects were appointed for all external works. 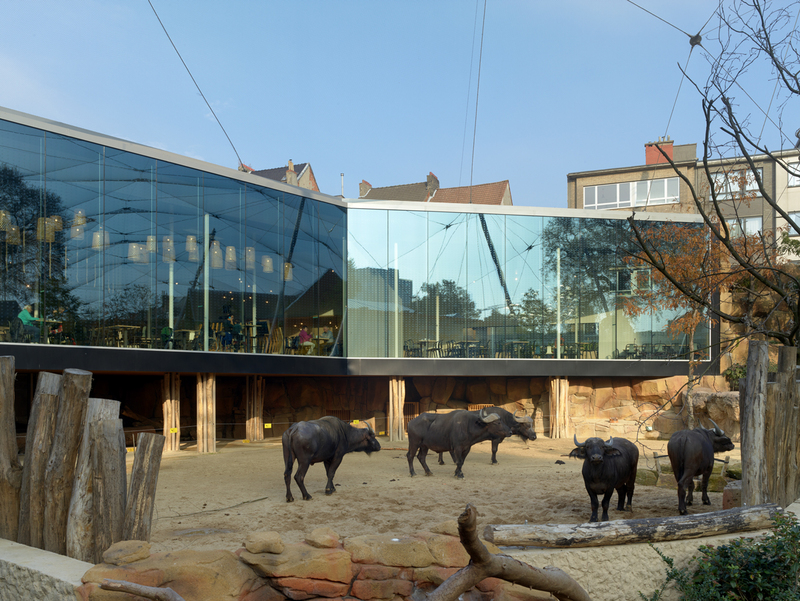 Inside the restaurant, interior and exterior merge into each other through the floor-height glass facade giving onto the buffalo grounds and aviary, shaped as an artificial savannah. The landscape is formed to replicate their natural habitat as accurately as possible within the urban context. Underneath the restaurant, the main visitor route passes through a cave-like tunnel into this savannah, allowing for a very close interaction between visitors and animals. eld was lead consultant, delivery architect and provided structural and MEP engineering services. Working on and around listed monuments is always a challenging undertaking. eld‘s long-standing professional relation with architectural restoration experts Origin proved fruitful in completing the restoration of these eclectic buildings successfully. Additionally, designing for a whole new user-group of wild animals was a very learning experience. Well-being of the animals was one of the design team’s primary concerns while developing concepts together with their care-takers.